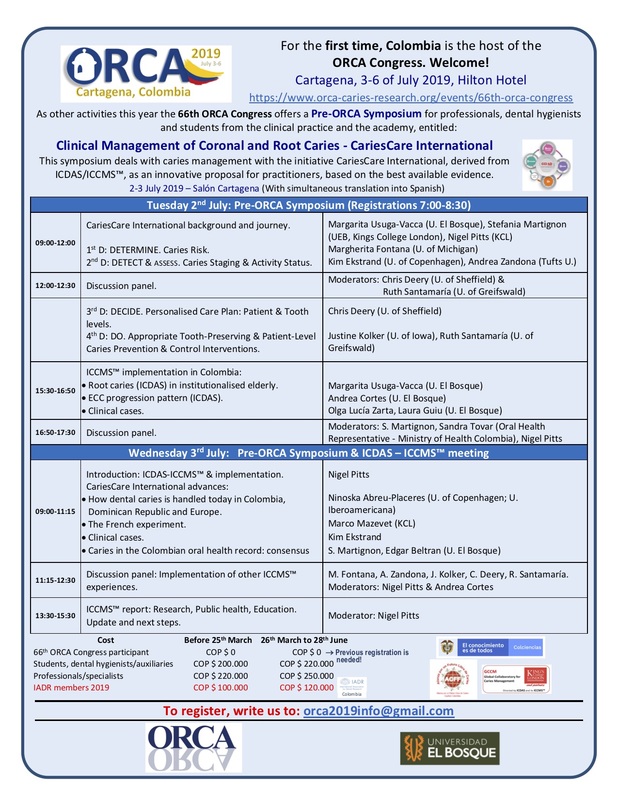 Clinical Management of Coronal and Root Caries – CariesCare International. Tuesday 2nd July: 8am – 5:30pm and Wednesday 3rd July: 9am – 3:30 pm. Venue: Salón Cartagena, Hilton Hotel, Cartagena. Wednesday 3rd July: 9am – 3:30 pm (merged with the Pre-ORCA Symposium). Aim: To continue advancing the mission of the ICDAS Foundation, through the development and implementation of the International Caries Classification and Management System (ICCMS™). This Saturday Afternoon Symposium deals with general aspects, epidemiology and clinical management of non-carious lesions: Developmental Defects of the Enamel and Erosive Tooth Wear. Aim: give a perspective on developmental defects of enamel (including MIH and dental fluorosis) and erosive tooth wear comparing work in Latin America plus USA vs. the rest of the world, and clinical management aspects.